Riders at start of the 1893 Buffalo Bill Cowboy Endurance Race. Doc Middleton with beard on left. Today, Doc Middleton is most famous for his participation in the great Buffalo Bill Cody’s Great Cowboy Endurance Race from Chadron, Nebraska, to Col. Wm. F. Cody’s Wild West arena adjacent to the Columbian Exposition in Chicago of 1893. In 1890, plans commenced for a World’s Fair in Chicago to celebrate the 400th anniversary of Columbus’ discovery of the Americas. Col. Cody made an application for a concession, but was turned down on the basis that his Wild West and Congress of Rough Riders was incongruous with the theme of the fair. This did not stop Cody. He secured lands immediately adjacent to the fair grounds and set up his own arena capable of seating an audience of 15,000. First, as a joke, and later seriously, plans were made for Buffalo Bill Cody’s Great Cowboy Endurance Race from Chadron to the Exposition with a first place prize of $200.00 and total prizes of $1000. Col. Cody agreed to contribute another $500.00 if the race would end in his arena. Additional prizes were donated including a saddle from Montgomery Ward and Co. and a gold-plated ivory handled revolver from the Colt Firearms Co.
To prevent cheating, a secret route with check stations was laid out. Each rider was permitted two horses with the requirement that the rider must arrive in Chicago on one of the original horses. Doc was sponsored by Wyoming and Sturgis, Dakota Terr., ranchman and horse breeder J. D. “Jack” Hale, who provided Middleton with one of his best horses, Geronimo. Doc’s second horse was Bay Jimmie. Other riders included Josiah B. “Indestructable Joe” Gillespie (1849-1933), James H. “Rattlesnake Pete” Stephens, and teenaged “Little Davy” Douglas. Rattleshake, because he used a string of rattlesnake tails as a hat band, from Kansas showed up two days prior to the race. 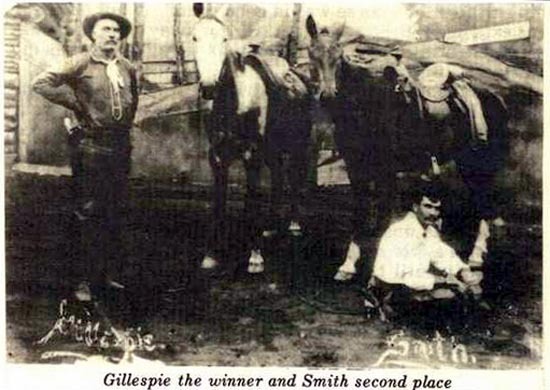 Gillespie, also known as “Old Joe,” was a stage driver and reputedly a friend of Butch Cassidy. At the last minute another rider, former stagecoach driver and railroad surveyor and land agent, John Berry entered, which led to a protest since Berry had helped lay out the secret route. On June 13, 1893 the riders, a crowd estimated at more than 4,000, and a cornet band gathered in front of the Blaine Hotel. The fire chief fired the gold-plated revolver and the nine were off. Crossing the sand hills of Nebraska, Little Davy became ill and dropped out. Berry missed the checkpoint at O’Neill, Nebraska, but provided an affidavit that he had not cheated. Geronimo became lame, but Doc continued on Bay Jimmie. The eight remaining riders crossed the Missouri at Sioux City. In Iowa, Rattlesnake Pete began coughing up blood and his first horse had to drop out. With a bottle of whiskey, Rattlesnake Pete continued on his second horse General Grant. Continuing on across Iowa, toward Illinois the eight rode. On the morning of June 27, word was received that the winning rider was seen approaching the fair grounds. The rider’s horse looked to be in good condition but mud splattered. The rider, however, looked worse for the wear, for he had ridden 150 miles in the last 24 hours. In the arena, Col. Cody resplendent in a white outfit decorated with silver, representatives of the Humane Society, and a crowd estimated at 10,000 awaited. 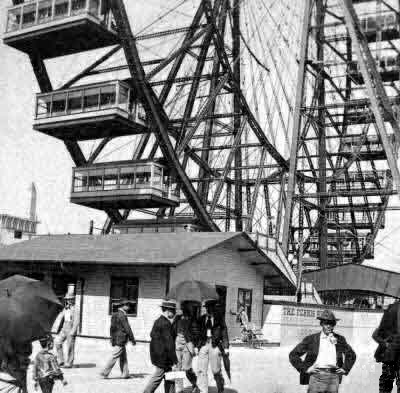 Beyond Col. Cody’s arena, loomed the centerpiece of the midway, G. W. G. Ferris’ giant 320-ft. high steam-powered wheel, bearing 36 cars, each of which could accommodate 40 passengers and a lunch counter. Above the fair grounds, a huge gas-filled tethered balloon was making its ascent into the heavens. The balloon permitted intrepid passengers to ascend 1000 feet and view four states. Near the center of the fairgrounds was the Mining Hall in which was located the Wyoming Pavillion. In the Pavillion, there were exhibits of petroluem, coal, and ferruginous rock from a mountain north of Laramie City. The mountain would later be made famous as the scene of a murder by a former Pinkerton agent. The rock assayed as high as 80 percent of metal. In the Agricultural Hall, another Wyoming exhibit displayed grains grown with the help of irrigation. Through the entrance to the arena the rider came. The entrance was flanked by images of Christopher Columbus as the navigator of the oceans and Col. Cody as the navigator of the plains. The two favorite riders were Doc. Middleton and “Old Joe” Gillespie. But the first rider was neither. Instead to the surprise of the audience it was John Berry who pulled up in from of Col. Cody. Over the next several days, the other riders came in. Doc dropped out in western Illinois with both horses coming up lame. He was, therefore, last. Immediately, accusations of cheating arose. Berry was declared the winner by Cody and received Cody’s first prize and the Montgomery Ward saddle. Old Joe was declared second-place winner by Cody. Berry was declared ineligible for the Chadron prize, he having participated in the laying out of the route and it being believed that he and his horses rode part of the route in a box car. Chadron declared Old Joe the winner and gave him the Chadron $200.00 first prize and the gold-plated colt revolver. Rattlesnake Pete was fourth in Cody’s determination and third by Chadron. Others, including Doc were accused of taking the train for a portion of the trek. Thus, the scene broke up in a fist fight refereed by the Humane Society. Campbell left Chadron with the rest and came all the way through on one horse. He had not a cent in his pockets when he started and didn’t pick up any on the way. Instead, he lost a bet of $250 that he would not be the last one in the race. Campbell’s Boomerang was in excellent condition, and so was General Grant, “Rattlsnake’s” animal. In actuality, all of the animals were in good shape in sharp contrast to those of the German Army which the year earlier had done an endurance race one-third the length of the Chicago to race. The German’s lost some 20 horses. Rattlesnake moved back to Hutchinson, Kansas, and died in 1957. James “Doc Middleton” Riley ended up in 1913 in Orin Junction where he operated a “blind pig” in a tent. One night a fight between several of his patrons broke out with a stabbing. Riley was arrested and thrown into the Converse County jail where he died suppposedly of erysipelas, a painful hemolytic strepococcus inflamation of the skin sometimes known as “St. Anthony’s fire.” A “blind pig” is an unlicensed saloon. Various derivations, mostly aprocryphal, are given for the term: (a) a Mason jar was sometimes called a “pig,” thus, prohibition era speakeasies were known by the term as a result of serving moonshine in the jars; (b) an illegal still was known as a “pig;” and (c) in areas in which sale by the drink of alcohol was prohibited, “Museums” would purportedly exhibit strange animals for which admission would be charged. The patrons would receive a “complementary” drink. The animals, such as the “blind pig” or “blind tigar,” would not in fact exist. The term, “blind pig” dates back at least to the 1870’s. Sheriff Al Peyton arranged for Riley’s funeral. Gillespie moved to Dewey County, Oklahoma, where he was known as “Dad” Gillespie. He died in Fay, Oklahoma, in December 1933.